"God willing, the nuclear weapons will not fall into the hands of the Americans and the mujahideen would take them and use them against the Americans," Mustafa Abu al-Yazid, the leader of al Qaeda in Afghanistan, said in an interview with Al Jazeera television. Mustafa Abu al-Yazid's statement is another reminder why President Obama is wrong to back away from the War On Terror. Maybe now the government of Pakistan can focus on confronting the Islamic insurgency in Pakistan's tribal areas. The New York Times report that in response to al Qaeda and Taliban efforts to destabilize the Pakistani government, U.S. officials are considering expanding covert operations in the tribal areas of Pakistan. 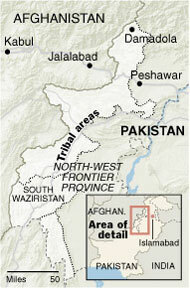 Even the report that officials are considering expanding covert operations in the tribal areas upsets the Pakistani's. According to the Times, some experts, argue that American-led military operations in Pakistan could result in a backlash and ultimately do more harm than good. Especially if Americans were captured or killed in the territory. That argument sounds like the naysayers who didn't want us to help the Afghans defeat the Soviets. We should not leave al Qaeda and the Taliban unmolested inside Pakistan. But the New York Times shouldn't be discussing our covert plans in the newspaper. It is believed that the decision to kill Bhutto, who is the leader of the opposition Pakistan People's Party (PPP), was made by al-Qaeda No. 2, the Egyptian doctor, Ayman al-Zawahiri in October. Mustafa Abu al Yazid is the leader of al Qaeda in Afghanistan. Bush administration officials said it was too early to identify a clear suspect in Thursday's assassination. But one U.S. official said: "There are a number of extremist groups within Pakistan that could have carried out the attack ... Al Qaeda has got to be one of the groups at the top of this list." Bhutto's assassination, and al qaeda's claim of responsibility for the cowardly act of murder, ought to serve as a wakeup call for those that believe we can just walk away from the war. "The United States strongly condemns this cowardly act by murderous extremists who are trying to undermine Pakistan's democracy. Those who committed this crime must be brought to justice," Bush said in a statement to reporters at his Texas ranch. Will Bhutto’s Assassination Impact The U.S. Presidential Campaign? The Wall Street Journal's Susan Davis reports the terrorist assassination of Benazir Bhutto is likely to force Pakistan and Islamic terrorism back into the forefront in Washington and on the campaign trail with the Iowa Caucuses only a week away.